This cutting-edge, applied book highlights the relevance of sociology by including a diverse collection of theories, research, and "lived experiences" that accurately mirror the diversity in society itself. The author's vivid, applied, personal writing style engages students, and activates compelling everyday examples that make sociology particularly relevant to today's diverse students. 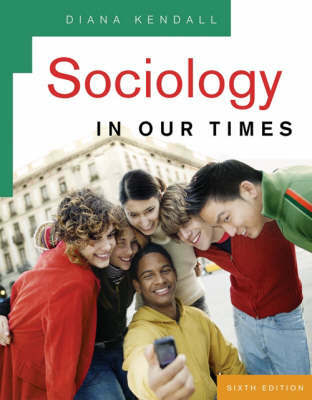 SOCIOLOGY IN OUR TIMES is noted for its especially strong integration of engaging "Lived Experiences" - extended examples that focus on various issues to illustrate chapter coverage. These extended examples are introduced with the vignette that opens each chapter and are then carried throughout the chapter in various boxes, features, and exercises. Kendall's text is acclaimed in the field for being the first textbook to integrate race, class, and gender issues, and for its thorough presentation of sociological theory, which includes diverse theoretical viewpoints such as feminist and postmodernist theory. Kendall shows students that sociology involves important questions and issues that they confront both personally and vicariously.